This top depicts an oni from the Momotarō legend, which originates from the Edo period (1600-1868). Oni are a kind of supernatural monster from Japanese folklore, often translated as “demon” or “ogre.” In many versions of the Momotarō legend, Momotarō, who is a boy who came to Earth inside a giant peach, later leaves the home of the elderly couple who raised him to fight a band of demons on a distant island. Most versions of the legend end with Momotarō defeating the demons and living happily ever after with his parents. 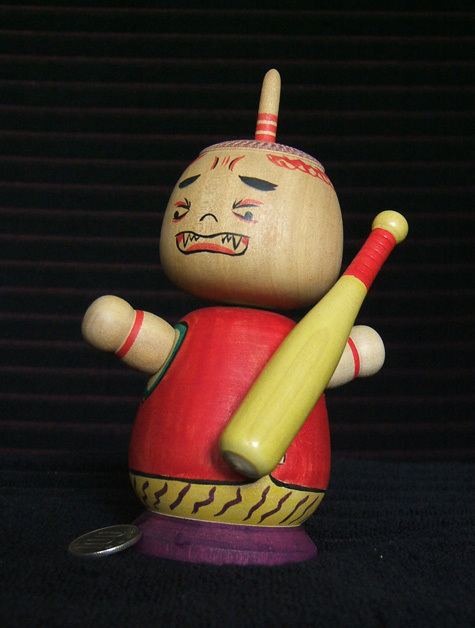 Hiroi Michiaki: This is an oni and Momotarō. I think there was another one that goes with this. Janell Landis: Ah, yeah yeah yeah.